In just the past 4 years we have made over 1600 custom orders!! We will be adding more pictures to this page as we catch up with the times......New camera etc.. One thing to mention.. We have done hundreds of custom jackets, chaps ,vests etc and to date we have not shown these on this page, that will change this year. 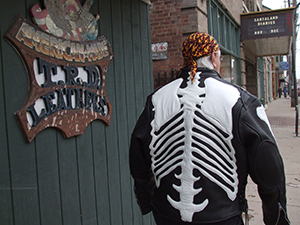 At TRD Leather we take pride in our ability to create custom products from special sizes and cuts in any of our leather garments to special needs for the bike. 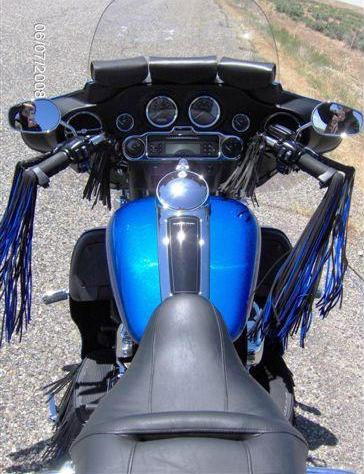 Custom sized and or shaped saddle bags, tool bags, floor board fringe etc. For many of our customers black is too common a color for leather so we offer the ability to create a product out of a variety of shades and colors. 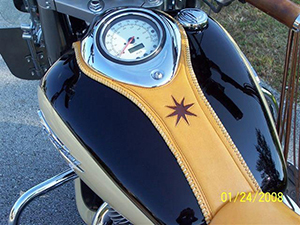 Let us personalize your leather to your style and personality. 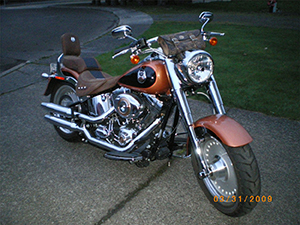 Charlie had us reverse the colors on his Anniversary edition seat and sissy bar pad in Crazy horse brown and black adding the tool bag fora nice balance. Doug came to us wanting some custom work . We created a great look in brown with slanted bags with braiding and 2-tone fringe. 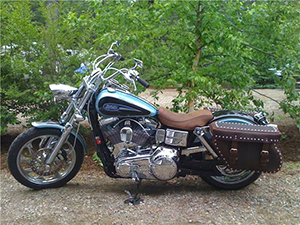 We recovered his seat, and custom made his sissy bar pad, tank panel, tool bags, and lever fringe to finish the look. 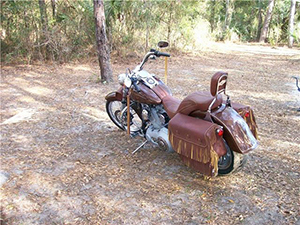 Geoff & Julia had us do Tobacco Deerskin & Buckskin with Buffalo bone, 2-tone fringe Big Bertha saddle bags, seats, floorboard fringe, sissy bar pad, and lever fringe. Alfred came to us with his own designs that we were able to make for him. Buckskin with buffalo bone and custom made buttons and Rosettes. 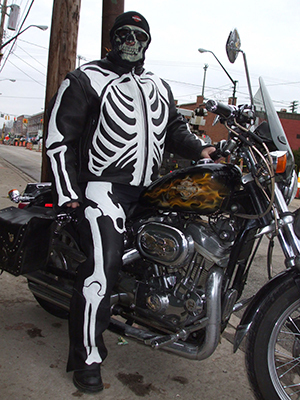 Mr. Bones (skeleton leathers) was created to HONOR those who have gone before and paid the ultimate sacrifice in Duty and Service to Us All. 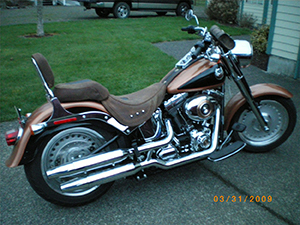 William dressed up his 1996 Royal Star. William chose a tobacco leather and buckskin old school look. 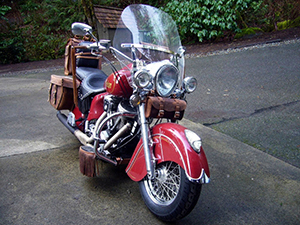 We recovered his original saddlebags and his seats and sissy bar pads along with a custom tank panel. 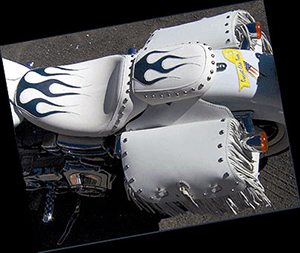 Custom Trunk bag & Full bike dressing – Yes, we do seats! 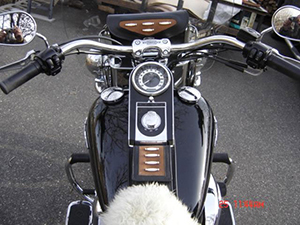 Tom & Cindy wanted Eastern Diamond back snakeskin inlay on Everything!! 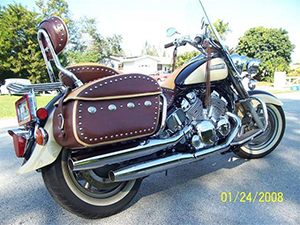 Jim And Vickie had us customize their bikes. Jim liked the tan seats & trunk bag. 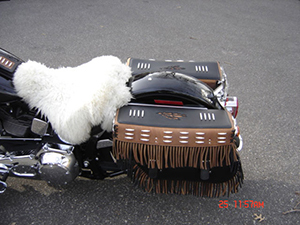 Vickie went all out with vest chaps and bike all done in white with teal rose inlay!